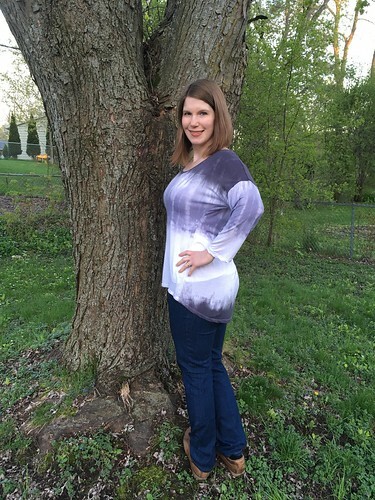 Still working on blogging things from the February sewing retreat! This is the last of what I made for me, but there are a few Summery items for Cheeks left. I’m really workin’ on stretchin’ this all out! 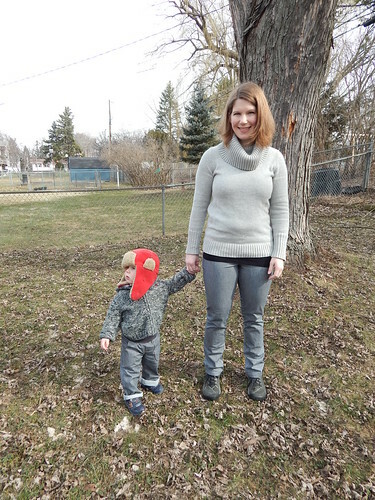 What we have today is Jalie 3352 and 3461, AKA Dolman Tops and Eleonore Pull-On Jeans. 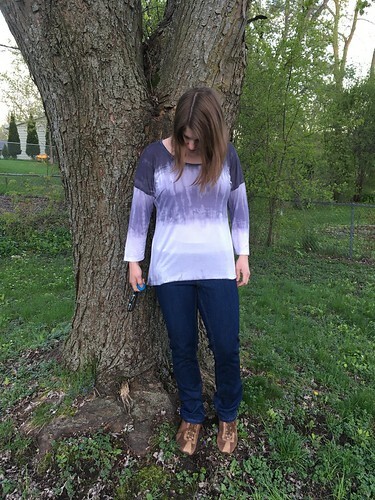 I’ve blogged for Fabric Mart about the Eleonore already, going over my fit issues and tweaks for both the jeans I made of their pinstriped denim AND of the jean I’m showing you today, which were technically my wearable muslin for the pinstriped version. 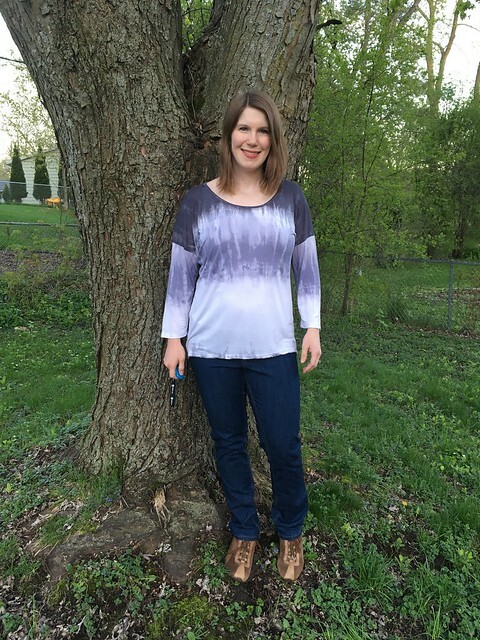 For the sake of keeping my blog “complete” (all of my shared makes in one place), and not having to re-write too much more about the pull-on jeans, I’ve re-blogged the Fabric Mart post below this one. TWO POSTS IN ONE, Y’ALL. Anywho, since we’re talking about Eleonore, let’s continue! 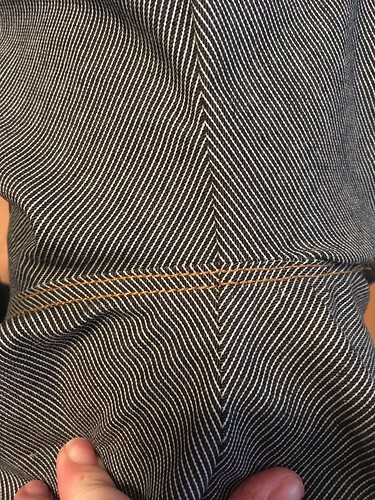 This is the pattern that has breathed calm into my pant-fitting-fears. I highly recommend it as a gateway into the scary fit world of woven pants. 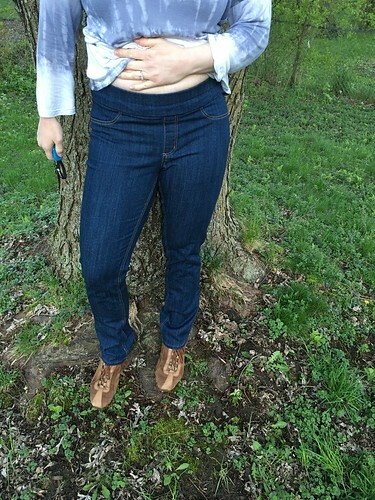 I had this stretch denim on hand and do not have a clue where I got it from or when I bought it. 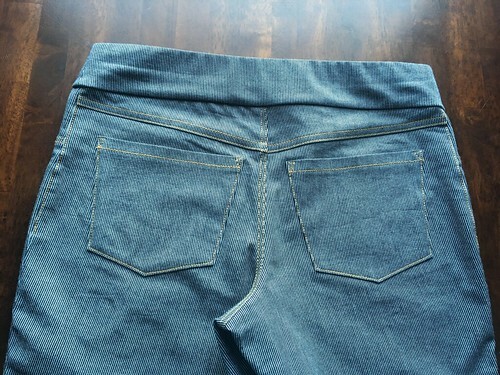 I DO know why I bought it: to make Jalie 2908 (stretch jeans), which I have yet to do. Ha! Hey, same pattern company at least. Despite the way they look with the belly (sigh), they do fit me well. 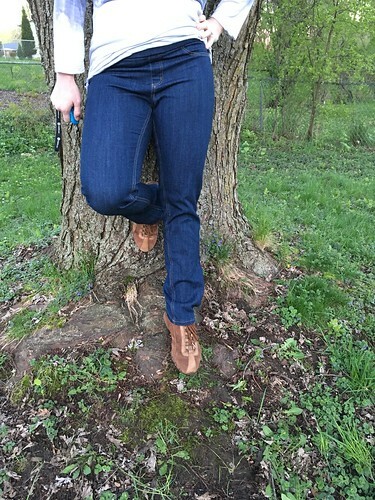 This denim really stretches out during the day, but the pants still stay on, and that’s what counts. Plus, they’re COMFY. Yes. I will make more and in this size instead of the too small size down of my FM pair (which will languish in my dresser until I lose weight or rid myself of them; sigh). 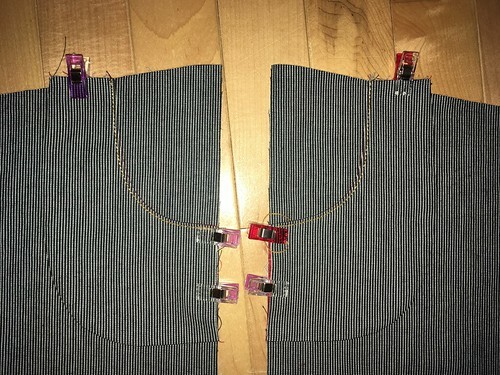 My upper hip/lower waist is proportionally much larger since Cheeks, so when making these I originally cut the pants in size U and the waistband in size V to compensate. 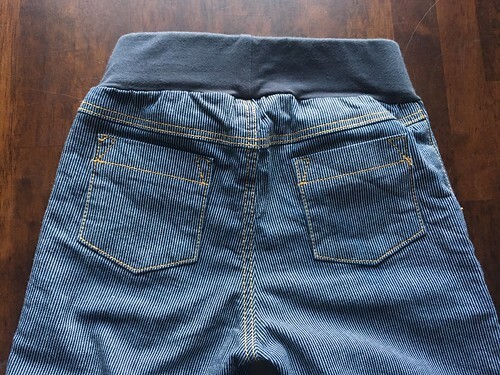 The latter was totally unnecessary, and I trimmed my waistband back down to a U.
There’s really not a lot more to say about these, other than I’m a fan and love how all of the topstitching looks. They’ve really whetted my appetite for jean sewing! 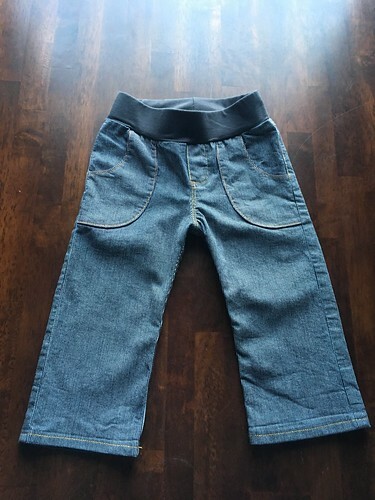 Hoping to make a capri or bermuda length pair for Summer. Love how this turned out! 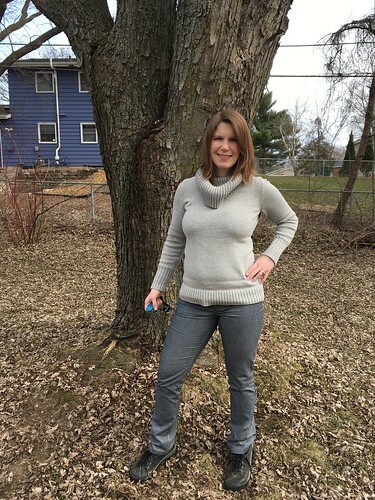 Made a size V (for a 37″ full bust; mine is about 38″ right now) with no fit adjustments and am fairly happy with the fit. 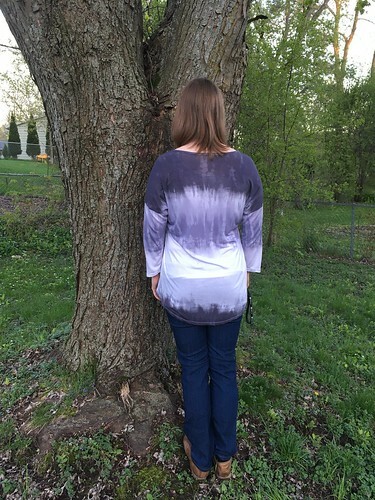 I know it’s supposed to be a bit loose, but am thinking I might try going down a size for the next version; at the end of the day sometimes it feels like this size is bordering on sloppy. This is another I definitely need more of for Summer, especially since this one is definitely a Spring wear with the sleeves. Will definitely go no sleeves next time! Hello, all! 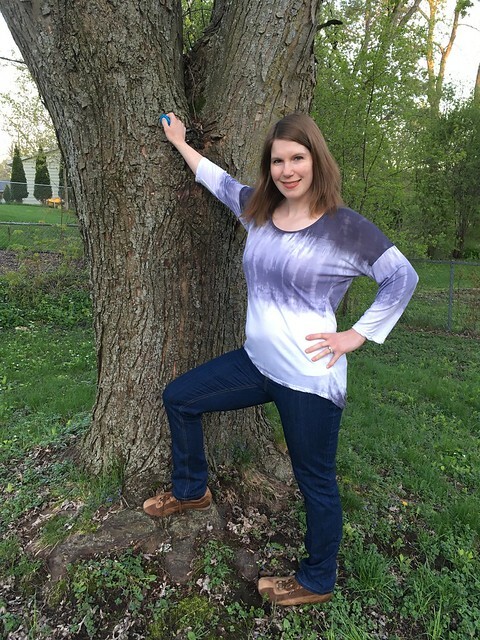 My name is Jess and I’m so happy to be here writing my first post. 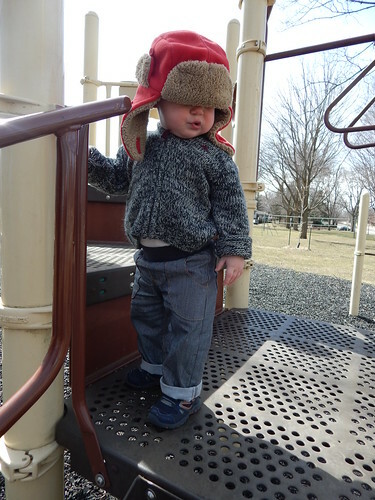 The sweet toddler is my son, Cheeks. 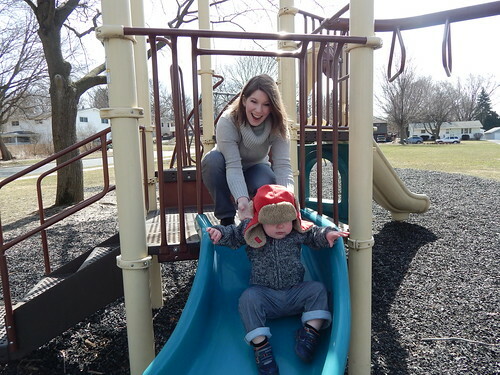 “Mommy and Me” is a popular thing in the world of girl-moms, but I haven’t really seen much of it around for boy-moms. 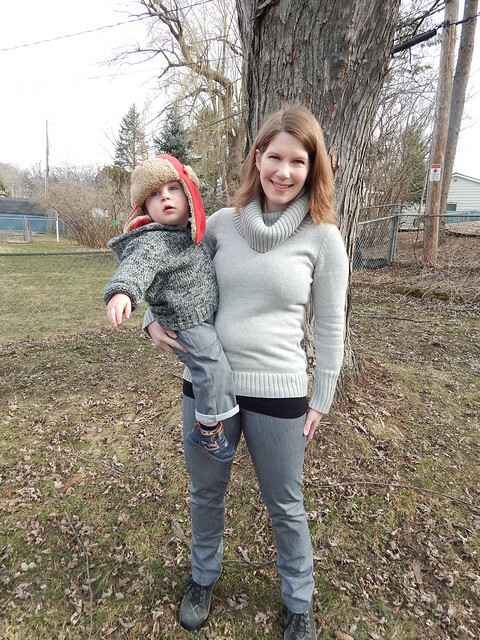 This got me thinking: why shouldn’t my boy and I have some matching clothing? Mama and me for Mama and Cheeks. YES! When planning a project, I am almost always inspired by either a fabric or a pattern (very rarely by a design seen “in the wild”). These projects are no different. I had an entirely opposite idea in mind at first, but this duo of pants are a definite case of fabric inspiration. 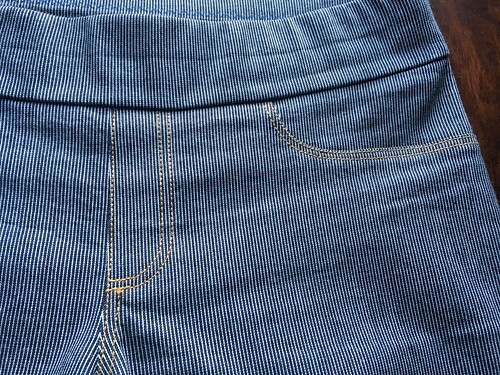 I was looking through the New Arrivals section and happened upon this pinstriped indigo and blue stretch denim. 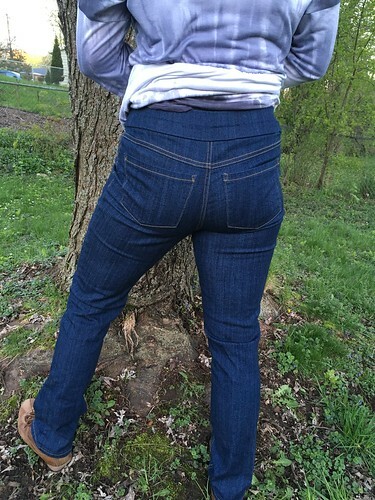 With a stretch of 20%, it dawned on me that it would be absolutely perfect for Jalie’s Eleonore Pull-On Jeans (#3461). 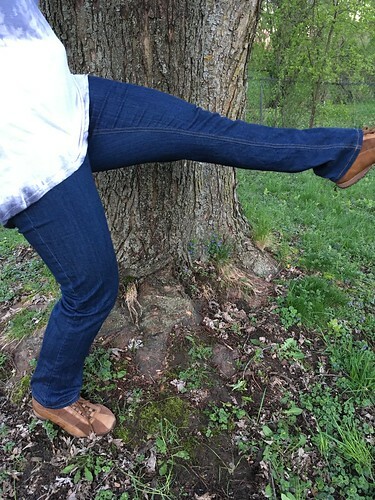 When I got this stretch denim in hand, I was really impressed. 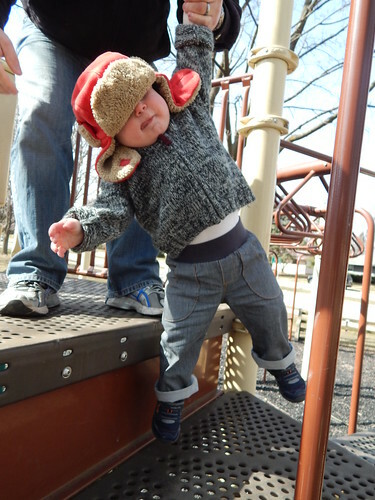 It’s surprisingly soft and has great stretch and recovery. It’s firm and has a nice amount of body without being bulky. 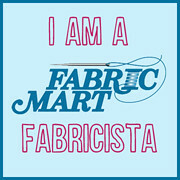 Unfortunately, it’s sold out now, but you never know what you’ll find next at Fabric Mart! 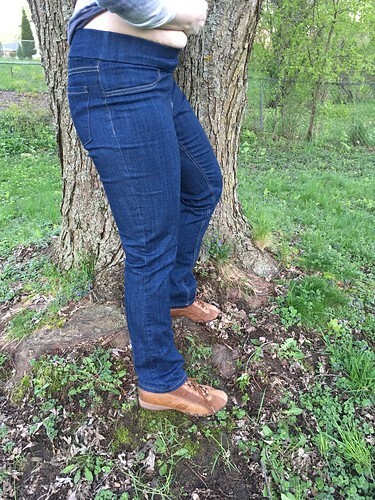 I began by making a wearable muslin from a different stretch denim (with comparable stretch) for my Eleonores, and found that the size U grew quite a bit over wearing. 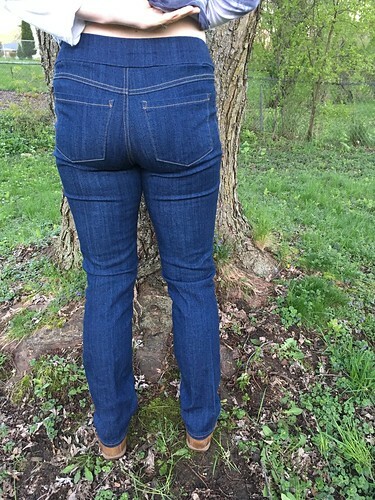 I had also proactively added 3/4″ to the back rise to account for my booty, and found that the crotch felt a bit long over the course of a day. 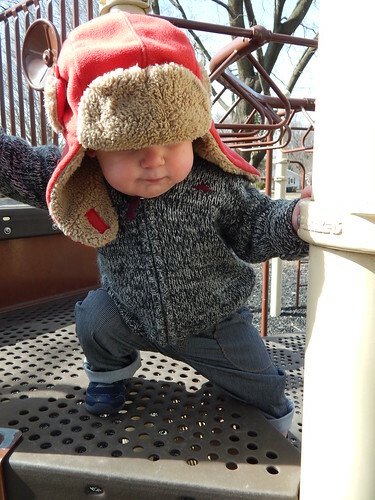 Had to include this one because Cheeks is so stinkin’ cute. 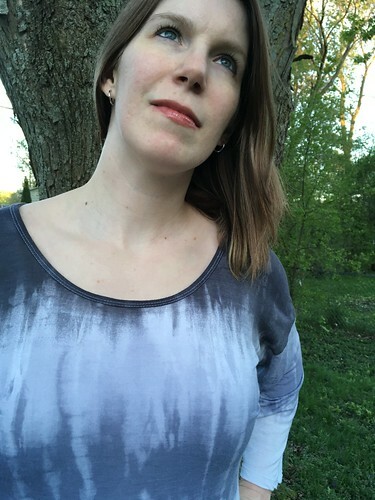 Despite my over-fitting mistake, this pattern is a game changer, and it’s no wonder: I love Jalie. They really understand how to fit the body. The funniest thing about these is that I attended Pattern Review Weekend last year, which had an indie pattern theme, and about 30 ladies decided to make the Eleonore in red! 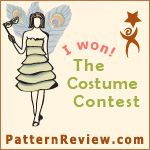 Wishing now that I had taken the plunge then: this pattern is a definite confidence booster! 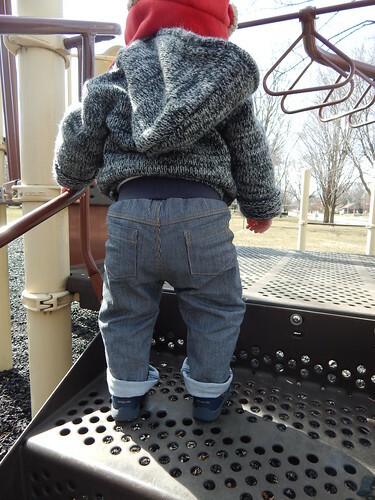 As for Cheeks’ pants, I opt for bigger when sewing for him: these are a size 3T shortened 1″ (per measurements he should be in a 2T). This is a fairly newly adopted philosophy on my part. 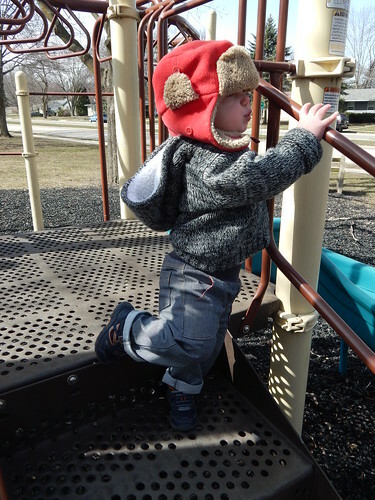 As we all know, children (especially toddlers) grow like weeds; I’d sometimes cut a garment for him and then wait to sew it, and he’d be almost grown out of it by the time I was done! 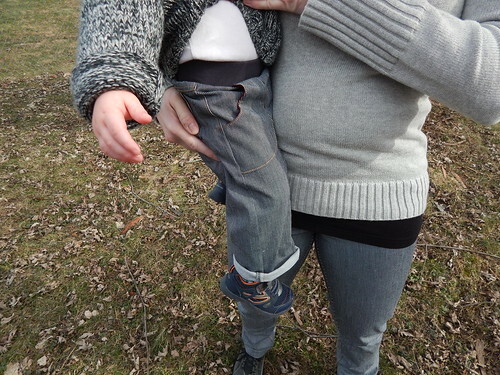 This has happened enough that I’ve started cutting his clothes at least a size bigger so there’s a good chance he’ll actually get to wear what I’m making for more than a split second. Overall, the pattern is good. It seems to be drafted well, but it sorely lacks notches and markings in several spots that would make everything crystal clear instead of a bit of guesswork. 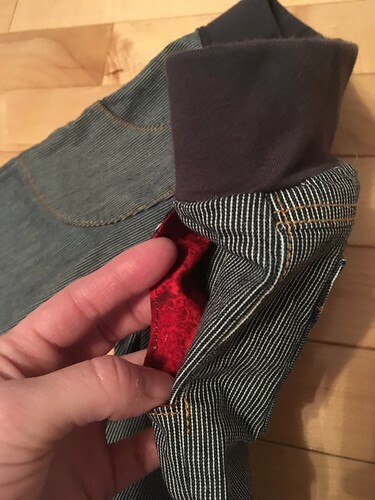 Particularly: notches to line up the front patch pockets, the center front marked so it’s clear where to stitch through the faux fly, and placement markings for back pockets. 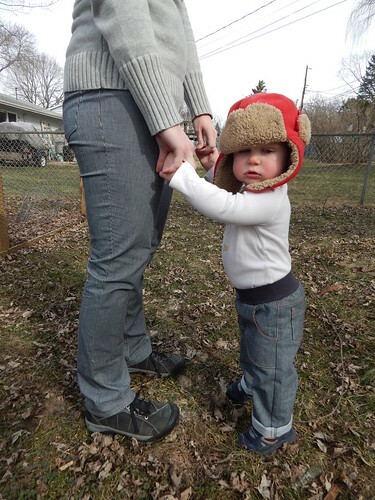 All in all, I’m fairly happy with how both of these turned out (Cheeks’ more so than my own, of course…) and am very excited about our matching Mama and Me jeans!